The MCFSP is a $700 million initiative to educate young people to drive change and make a positive social impact in their local communities. This program transforms young scholars from beneficiaries to benefactors, preparing them with the necessary knowledge, values, and skills to fuel social and economic progress across Africa. MCFSP is part of a global initiative to provide 300 scholarships over a period of ten years to academically talented, yet economically disadvantaged students from Sub-Saharan Africa. Scholars who enroll at UCT under this program receive full scholarships, academic support, peer mentorship, career guidance, transition-to-work support, internship opportunities and access to a global alumni network. For undergraduate students, the scholarship initially lasts for one ear, after which it is renewed subject to satisfactory academic performance. The postgraduate scholarship, however, is strictly for one year of study. The University of Cape Town (UCT) is the host school for this scholarship. UCT is South Africa’s oldest university, and one of Africa’s leading teaching and research institutions. Note that you must first apply to UCT for academic study and placement. Applicants must refer to the respective prospectuses and faculty handbooks before applying. Please contact the relevant department admissions office for more information. Collate the necessary supporting documents to strengthen your academic application. All documents should be clear and legible. Each document should be scanned and uploaded as a single document. Apply online for the academic study program of your choice, and course placement. Once your application has been received, you will get a UCT applicant number (and username) and password, which you will use to track the status of your application online. International applicants who receive an offer for admission to UCT are required to obtain a study visa to enter the Republic of SA and to register at UCT. STEP 4: Await the outcome of your application. Download the application form – MCFSP Application Form. Email the completed form and supporting documents to info_mfsp@uct.ac.za before the deadline. Make sure that the application form and supporting documents are legible. Put in as many relevant details as possible, and provide supporting documents as requested in the online scholarship application form that will add credibility to your application. For any queries or assistance in completing the scholarship application form, email info_mcfsp@uct.ac.za or call +27 (0) 21 650 5923/3601. Applications close on September 30, 2017. 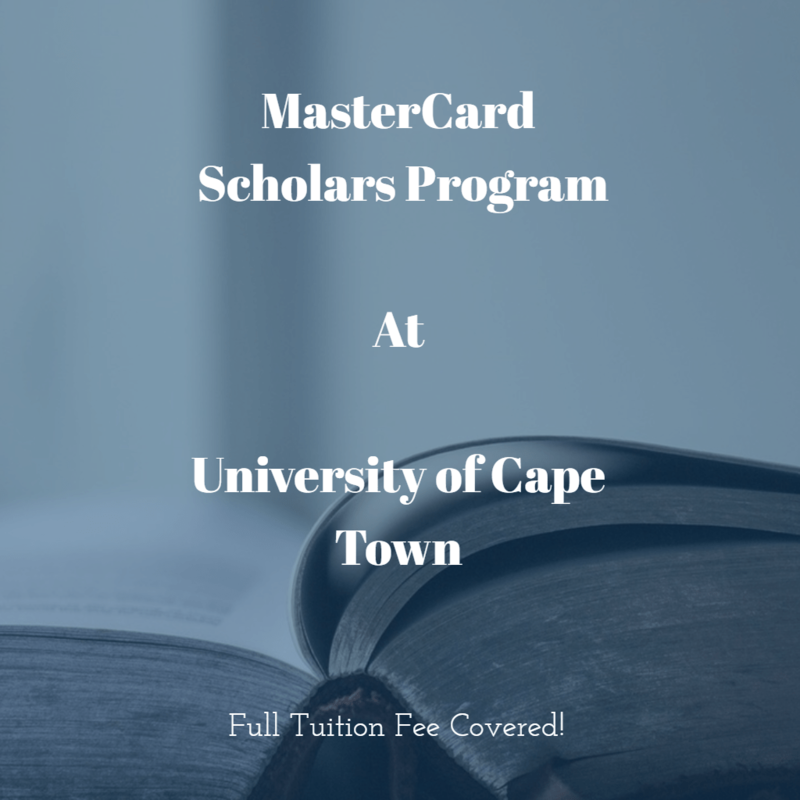 To learn more about The MasterCard Foundation Scholars Program, visitmastercardfdnscholars.org. To learn more about The MasterCard Foundation, visitmastercardfdn.org.